When it gets boring, I always find solace in movies. That day, I bumped into my old friend. We hadn’t met in a while and after talking to her seemed that we both needed and deserved a break. So, we decided to do the good old way, through a sumptuous movie marathon. We set aside the weekend, dropped everything else and even switched off our phones. We even decided not to use internet for these two days. Then we thought what can be watched? I suggested we watch some serious action movies. Here is what we watched. 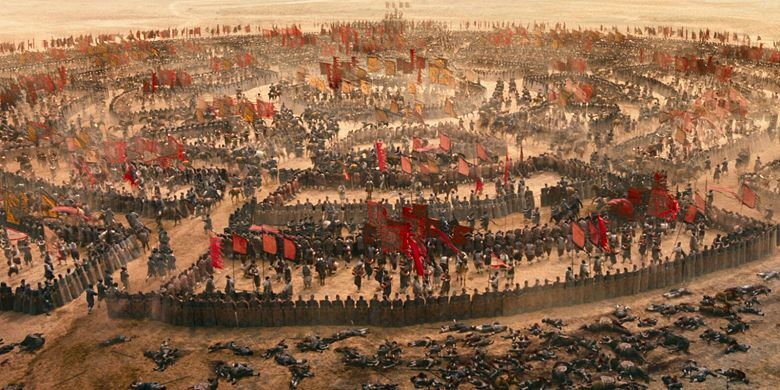 Red Cliff (2008): If you thought Chinese cinema is all about Kung Fu, you should try out Red Cliff, which is a true epic in all respects. One of the most expensive films ever, it tells a historical tale, albeit with creative liberties and stylistic flourishes. Top class actors, massive sets and top notch production values deliver some of the most memorable battle sequences ever filmed on celluloid anywhere. John Woo, who has also made a name for himself in the Hollywood with films such as Face Off and MI 2 etc., returns home with gratifying form through Red Cliff. Watch it to find out how a “tortoise formation” works in the battlefield or to see how one of the earliest biological warfare was carried out centuries ago. But there is only one catch here. The western version released in these parts is the shorter one which misses out on a lot of action. The original film was so long that it was divided into two parts. If possible, try to get the two part version. Ghost in the Shell (1995): Now it is a bit peculiar to start such a list with an anime. But the fact is that, Mamoru Oshii’s Ghost in the Shell is one of the most imaginative films ever pulled off through animation and not to mention that it is far ahead of its time. Cybercrime, various levels of consciousness, stylized gunfight, people hacking into people… sounds like Matrix? Yes of course, but please note that this film predates Matrix by four years. The Wachowskis were blown away by this film and they decided to do something similar with real actors and much bigger budget, and the result was the Matrix franchise. Banlieu 13 (2004): Most Bollywood fans thought Salman Khan’s Wanted had cool action. But that was nevertheless the remake of a Telugu film. But even that was hardly original. If you want to see authentic “Parkour” stunts done by real exponents, Pierre Morel’s Banlieu 13 is the film. There is nothing much in the story but it allows enough scope for the actors to display Parkour stunts. And no, even if you have seen the Indian films that will not dilute the experience because they are simply no match to the original. Stagecoach (1939): Along with Gangster films, Western has been the oldest enduring action genre in Hollywood. Spaghetti westerns of Clint Eastwood are all too familiar in that sense. While not too many westerns are made nowadays, we have seen a couple of good remakes or reinterpretations in recent times such as 3:10 to Yuma and True Grit. But the real westerns were the ones made in the black and white and the Technicolor era with the greatest stars of Hollywood’s golden age. John Ford’s Stagecoach is one of the most adrenaline pumping western I have seen from that era. Considering the technical limitations of the 30s, the kinetic chase sequences are both remarkable and admirable. It is literally about a bunch of people travelling on a stagecoach through a lawless terrain where they are attacked by hordes of American Indians. Such portrayal of Indians will be considered racist nowadays, but let’s face it, it is gunfight at its best and it boasts of the greatest cowboy of all time, John Wayne. The Raid: Redemption (2011): I know there are lots of Tony Jaa fans out there. But his films are now being played everywhere, over and over again. So, what can you do if you want to experience similar bone crushing stunts with a different guy? Your answer lies with Iko Uwais, the rising action star from Indonesia, who is also an exponent in the local martial art, Silat. Gareth Evans’ The Raid is a cop film with extreme action and a colossal body count. This is the second film by the director-actor duo. The plot is nothing to write home about, but who cares anyways? Catch it before he also becomes too familiar. And Yes… at the end of the day we were totally exhilarated after this ride. My friend had just moved to Delhi and already tired of her search for accommodation. This made her get over the homesickness she felt after leaving Mumbai. We are planning do more movie marathons in the future. Probably will watch something other than action but probably will get more friends to spend time together and enjoy guilt-free enjoyment by forgetting everything else for a while.